For a third consecutive year, Dentons is proud to support the Mining & Investment Latin America Summit (MILA), the largest mining and investment event in Latin America, which was incepted in 2014. This year’s summit will host an audience of more than 650 attendees, including miners, investors and financiers. For a preview of the discussion to take place on mining mergers and acquisitions, read “Mining M&A and Consolidation: Are We There Yet?”, originally published in the Mining & Investment Latin America Special Report 2016. Taking place on October 24-25, MILA will give attendees an overview of the key opportunities that exist in the Latin American mining industry. Mining group partners, Brian Abraham and Catherine Wade of the Firm’s Vancouver office, James Valdiri of the Bogotá office and Christopher Manderville of the Calgary office, will be joining attendees for two days of business matching, knowledge sharing and deal-making. 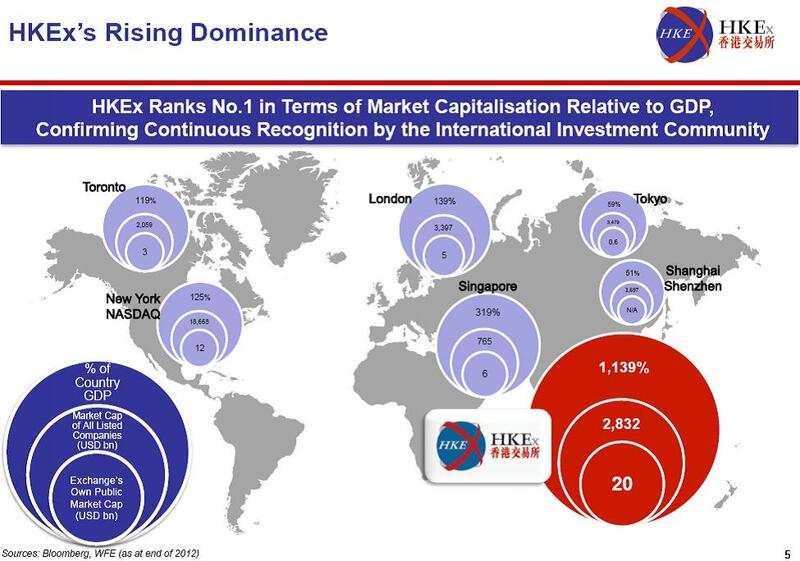 Michael Chan, Assistant Vice President of the Global Markets Division of the Hong Kong Stock Exchange (“HKEx”), was recently in Canada, visiting Calgary, Toronto and Vancouver and delivering a presentation entitled “HKEx – the Listing Venue of Choice”. There was interest from many representatives from the local financial and business communities, reflecting an interest in accessing Asian capital. The Toronto Stock Exchange (“TSX”) and TSX Venture Exchange (“TSXV”) have flourished as listing platforms for mining and other resource companies, both for domestic Canadian companies and for companies from outside of Canada. The flexibility of the Capital Pool Company (CPC) has over the years attracted many businesses, including those from Asia, into utilizing the TSX and TSXV as a capital markets gateway. As a result, TSX and TSXV have been arguably the most successful markets in drawing resource company IPOs. Hong Kong has a user-friendly common law legal system, minimal government interference with business, a highly sophisticated banking structure, lack of foreign exchange controls, as well as a collection of financial institutions and markets characterized by a high degree of liquidity. Its geographical accessibility and absence of language barriers has made it a magnet for Mainland Chinese capital, and with it an eager investor population which has been ready to part with their cash. Although 2012 was not the best year for fund-raising, the numbers are still significant. According to government statistics, Hong Kong’s stock market was the sixth largest in the world and the second largest in Asia in terms of market capitalization as at the end of September 2012, even with the global slowdown of economic activity. Hong Kong was the most active market for initial public offering (“IPO”) funds raised globally in 2009, 2010 and 2011. 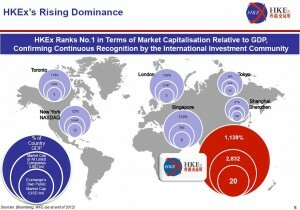 Even with the growth slowdown of 2012, 1,533 companies were listed on the HKEx as at the end of September of that year, with a market capitalization of close to HK$ 20,000 billion (US$ 2,580 billion). Among them, 710 were Mainland Chinese enterprises which have together, since 1993, raised close to HK$3,400 billion (US$440 billion). 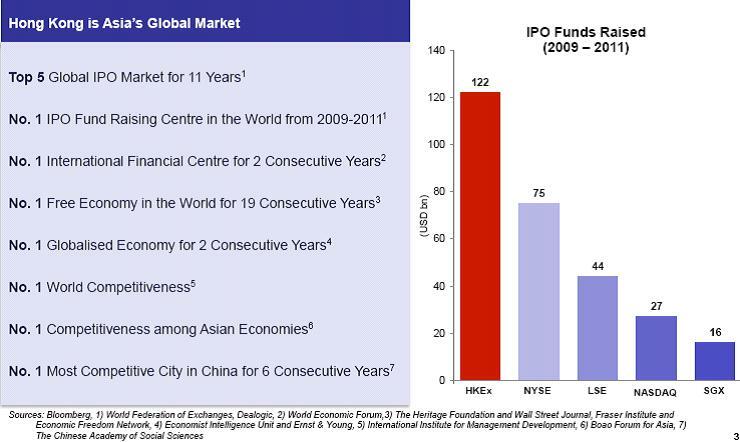 You can go public in Hong Kong in one of three ways – an IPO, by introduction (where existing shares are listed with no fund-raising) and by acquiring a listed “shell”. For mid-cap and small-cap companies, however, the second method does not achieve the goal of raising new capital, whilst the third option is a costly exercise. That leaves the plain vanilla IPO. Hong Kong boasts a substantial following of both retail and institutional investors and both local and overseas investors. This healthy mix gives the market a good volume of activity, hence liquidity. 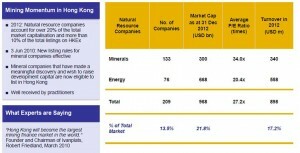 For resource companies, recent changes to Chapter 18 of the Listing Rules have made the HKEx a resources-friendly stock market. for mining companies, at least a meaningful portfolio of Indicated Resources. 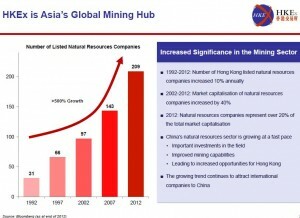 The profit test, the market capitalization/revenue cash flow test and the market capitalization/revenue test can be waived if the HKEx is satisfied that the directors and management of the Mineral Company have sufficient and satisfactory experience of at least five years in mining and/or exploration activities. The management continuity requirement will still apply unless waived. New applicant Mineral Company applicants must include independent technical reports (Competent Persons Report) on Reserves and Resources in their listing documents. If they have not commenced production, they must publicize their plans to proceed to production with indicative dates and costs. A Competent Person must provide an opinion to support this. New applicant Mineral Company applicants must also have working capital for 125% of their present requirements for the twelve months following listing. Possible Reserves, Contingent Resources or Prospective Resources carry no economic value. 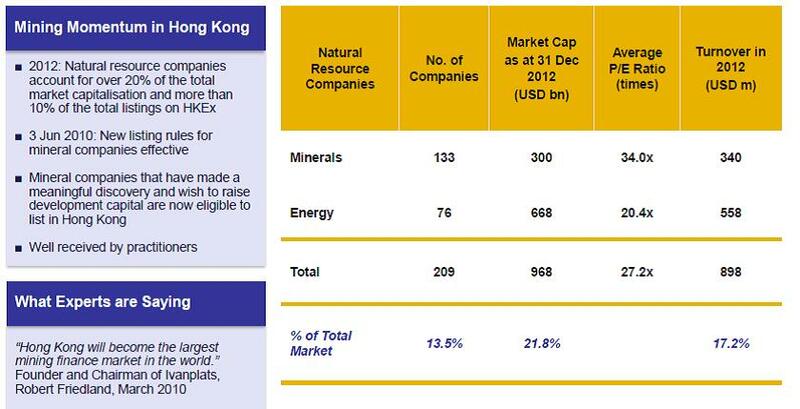 As for mining and other resource companies listed in Hong Kong to date, count amongst them China Gold International Resources, South Gobi Energy Resources (both mentioned below), United Company Rusal, Glencore, Kazakhmys PLC, Mongolian Mining Corporation and Vale. Are the provinces of Canada acceptable overseas jurisdictions for companies applying to list? To date, Canadian companies listed in Hong Kong have come from British Columbia (SouthGobi Energy Resources Ltd. and China Gold International Resources Corp. Ltd.), Ontario (Manulife Financial Corporation) and Alberta (Sunshine Oilsands Ltd.). BC, Ontario and Alberta are, up to now, the only Canadian jurisdictions currently accepted by the HKEx. That’s not to say that Canadian companies incorporated in other provinces cannot list in Hong Kong. They just have to make a case that their shareholder protection provisions under local corporate law are just as protective as provisions under Hong Kong company law. This requirement in Hong Kong is a universal requirement for all companies from foreign jurisdictions wishing to list, even companies from Mainland China. The CO requires a three-fourths majority to vote through issues relating to variation of incorporation documents, share class rights, voluntary winding-up and share capital reduction, while the ABCA requires only a two-thirds majority. The ABCA provides different ways to effect a repurchase of shares, dividend distribution, share capital reduction, etc. To be sure, Hong Kong is not the easiest place in the world to get listed. The HKEx micro-manages the listing process, rather than leaving it to the investors’ own devices to sue if something goes wrong. This is due to the large retail investor population in the region. In fact, in the case of United Company Rusal, the HKEx took the unprecedented step of setting a minimum amount of investment in an effort to deter retail investors. Another issue to consider is cost. Hong Kong regulators place a huge responsibility on investment banks to do due diligence on the companies they seek to bring to the market, and as a result, bankers will look to spend a substantial amount of fees conducting as thorough due diligence as possible, fees which they will pass on to the listing applicant. This process becomes disproportionately costly if not properly controlled. All in all, the market is open for business – international companies and resource companies are welcome and companies seeking to take the next step to a dual listing can look to the “Eastern Promise”. *All charts from Hong Kong Stock Exchange and sources quoted therein. As expected, the proposed amendments would retain for SOEs the current review threshold which is based on the target Canadian business’ book value of assets ($344 million in 2013) while non-SOEs would be subject to a higher review threshold based on enterprise value (to be set at $600 million when implemented, rising to $800,000 in two years and then to $1 billion four years later). The result is that, relative to non-SOE investments, SOE investments will be more often subject to Ministerial approval on the basis of the “net benefit to Canada” test, enabling closer scrutiny of SOE investments in Canada. What may be surprising about the proposed amendments is that they give the Government very broad latitude to ignore the general ICA rules in making a number of critical determinations that affect whether a proposed transaction is subject to review under the ICA. If reviewable, a transaction will be subject to a time-consuming process, potential delays to closing (and in rare cases, rejection) and almost always significant commitments to the Canadian Government on a broad range of issues. The uncertainty generated by the Government’s discretion under the amendments is exacerbated by the potentially very broad scope of the term “SOE”. defining when an acquisition of control occurs. The ICA general rules establish presumptions regarding when control is acquired. For example, they state that the acquisition of less than one-third of the voting shares of a corporation or of less than a majority of the economic interests of a partnership is deemed not to be an acquisition of control. If there is no acquisition of control, there is no requirement for a “net benefit” review under the ICA. For an SOE, these rules need not be applied if the Minister concludes based on “any information and evidence” made available to him that the SOE will acquire control in fact. determining whether one entity is controlled by another. The ICA general rules set out rules and presumptions regarding when control exists. However, the proposed amendment would permit the Minister to go beyond those rules in assessing whether an SOE controls another entity in fact. whether an investor is Canadian or not. The ICA establishes rules to determine the Canadian status of an investor. Pursuant to the proposed amendment, an entity that would otherwise be considered Canadian-controlled may be judged to be an SOE if the Minister concludes that it is controlled in fact by an SOE. All of the above decisions may be retroactive to April 29, 2013. As noted above, the repercussions of bypassing the normal presumptions and rules on these points could be serious for an SOE investor. A decision by the Minister that the investor is controlled in fact, directly or indirectly, by a foreign state means that the transaction will be subject to a lower review threshold. In addition, a transaction that would not otherwise be subject to the ICA “net benefit” review and notification regime – such as a minority investment, including a 50% interest in a partnership or joint venture – because it did not constitute an acquisition of control, could be reviewed because of the Government’s determination that control in fact was acquired. As an assessment of “control in fact” can be relatively subjective and depend on a detailed analysis of the terms of the investment, it may be unclear, especially early on the deal process, whether the SOE investment is an acquisition of control in fact under the ICA and therefore potentially reviewable. The uncertainty described above may be exacerbated by the vague definition of an “SOE”. As contemplated in the Government’s statements on its new SOE policy in December last year, the definition of an SOE now includes not only the government of a foreign state or agency of such government and an entity that is controlled, directly or indirectly, by such a government, but also an entity that is influenced, directly or indirectly, by a foreign government. There is no guidance as to what constitutes “influence” which raises the spectre of foreign corporations being deemed to be SOEs because of the presence of foreign government representation on boards or because of senior management links to government officials (e.g., Huawei whose founder was a senior officer in China’s People’s Liberation Army) or to political parties (e.g., would the presence of party officials in key positions in major Chinese corporations make them “influenced” by a foreign government?). Significantly, the definition of an SOE has also been expanded to capture individuals acting under the direction of a foreign government or under the direct or indirect influence of a foreign government. As a result of the proposed amendments, private companies or individuals could be subject, at the Government’s discretion, to the lower SOE review threshold and to the potentially more stringent review process applicable to an SOE . Finally, the proposed amendments would extend timelines for the national security review of transactions. There are numerous prescribed time periods in the review process and these are to be lengthened from five days to 30 days or as agreed to between the foreign investor and the Government. The Government’s message in the proposed ICA amendments is clear but also muddied. What is clear is that the Government will be watching out for SOE investments and will scrutinize such transactions more closely. What is muddied is the reviewability of investments by SOE investors (especially minority investments) as well as the potential application of the lower SOE review threshold to investments by individuals and private companies that are not owned, directly or indirectly, by foreign governments, but somehow subject to foreign government influence. While investors may request a Ministerial opinion to clarify whether a given investment is subject to review, there is no requirement under the ICA for the Minister to provide such an opinion, unless the request relates to a determination about the Canadian status of the investor (and even this exception is to be limited under the proposed amendments to transactions in which the target Canadian business is in a cultural industry). In short, as a result of the proposed amendments, SOEs and foreign investors that might possibly be viewed as SOEs may, depending on the type of investment planned, face a higher risk that their investments will require Ministerial approval in order to close compared to non-SOEs investing in Canada. 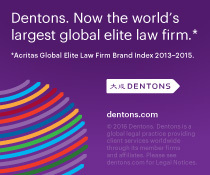 If you would like further information, please contact Sandy Walker at Dentons Canada LLP. Fraser Milner Casgrain LLP, KPMG LLP and its subsidiary SECOR Inc. have released today a study presenting an analytical framework for evaluating the different mining royalty regimes which are being used worldwide. The authors hope the study will provide a framework for informed debate regarding mining royalty regimes best adapted to Quebec’s economic and mining circumstances. The quest for such determination has been provoked by an important public debate that is currently ongoing in Quebec as a result of the recent launch of the Plan Nord. The study analyzes four royalty schemes for a standard Quebec iron mine or gold mine: i) profit-based royalties, ii) ad valorem royalties, iii) West Australian style of royalties and iv) hybrid royalties. The study concludes that no scheme is universally superior to the others and that it must be adapted to the territory. Given the fact that Quebec’s mining sector is relatively marginal on an international scale (representing less than 1% of global production), and that Quebec has high production costs based on the fact that its variable climate, its mining deposits are generally less concentrated and that it is at a great distance from the emerging Asian market, the study focuses on the importance for Quebec to remain competitive. A profit-based royalty, the current royalty regime in Quebec (at a rate of 16 %), adjusts to the profitability of the mining project. Thus, when prices are low and mines become marginal or not profitable, this regime does not compound the problem. This is particularly important in regions where production costs are higher. Avoiding a supplementary burden in such a situation can help mines pass through a depressed mining cycle, without having to stop production. When prices are high and profits are up, such a profit-based scheme gives governments a larger proportion of the extracted value. However, the royalty amounts collected by the government will experience greater fluctuations and there is a risk that they may be nil for some mines during certain years. The ad valorem royalty facilitates the collection of more constant royalty levels under various price variations. However, this royalty adds a significant cost burden to the mining companies when the prices are low and the mining projects are less profitable. This, in turn, adds a significant amount of risk to the project and reduces its net present value relative to the same project subject to a profit-based royalty. An ad valorem royalty imposes the payment of royalties even when profits are weak or non-existent. This could lead to the accelerated closure of mines when prices are low and the postponement of potential projects. Ad valorem royalties are much less complex to put in place and are more common in developing countries, where fiscal administration is not well established. The hybrid royalty and the West Australian style of royalty combine, to varying degrees, the advantages and disadvantages of the previous two schemes. The study concludes that high mining royalties do not necessarily translate into revenues as future investment may be compromised. The study recommends a regime be calibrated to optimize the benefits for Quebecers in the development of mining potential with a view not only to government revenues, but to impacts on investor decisions and regional characteristics of the sector. Importantly, the study notes Quebec’s other mining investment assets are the quality of the business environment (political, legal and fiscal), the availability of trained professionals and workforce, the quality of its geological database and the potential of a very large territory which has not yet been explored. For further information please see the attached press release and study, or contact a member of the FMC mining team. David Hunter, Senior Counsel at FMC, will be reprising his role as lecturer in environmental law at Shanghai’s East China University of Politics and Law in May 2012. This course is part of the law and economics program at the Graduate School and will be co-taught with Professor Jinhau Cheng. David also lectured at the university in September 2011. This article was written by Sandy Walker and Patrick Robert. Answer: Each of them may benefit from Canadian Prime Minister Harper’s recent visit to China. In the view of some seasoned China-watchers, the Prime Minister’s trip may be remembered as the most important visit by a Canadian prime minister in a decade for the sheer volume and depth of bilateral commitments and agreements achieved, including 23 agreements between Canadian and Chinese companies generating a reported $3 billion (not to mention China’s agreement to loan two giant pandas to Canada). Though the U.S. continues to be Canada’s number one trading partner, China is its second most important by far and is anticipated to become even more so as China is expected to become the world’s largest economy by 2020. Canadian investment in China is at a record high, having increased by 38 percent over 2009 levels. Probably the signal accomplishment was the conclusion of substantive negotiations on the Canada-China Foreign Investment Promotion and Protection Agreement (FIPA), an accord that has been in the works for the past 18 years and is expected to be among the strongest such agreements China has signed with foreign countries. Although the accord must still undergo internal approval processes in the two countries (including being presented to Parliament in Canada), the safeguards it provides for Canadian investors in China are significant. For example, the agreement provides Canadian investors with recourse against public policy actions by the Chinese government that are detrimental to their investments. As a result, investors would, to some degree, be shielded from unpredictable and arbitrary actions that may impede Canadian investment in China. A second accomplishment is an agreement permitting Canadian uranium producers to export nuclear fuels and advanced nuclear technologies to China, the world’s largest energy consumer. This supplements the Agreement between the Government of Canada and the Government of the People’s Republic of China for Co-operation in the Peaceful Uses of Nuclear Energy of 1994. The Canadian Canada’s nuclear energy industry is significant, generating approximately $6.6 billion in annual revenue and $1.2 billion in exports each year. This agreement will level the playing field for Canadian uranium producers vis-à-vis other countries such as Australia and Kazakhstan which already benefit from such agreements. The visit also generated the renewal or establishment of a raft of memoranda of understanding in a number of areas, including energy, fisheries, food inspection, natural resources and education. There will also be increased technical cooperation between Canadian and Chinese experts in research, technology and innovation. The Canadian Government also regards developing increased trade in energy as crucial as Asian markets are both strategic significant and geographically accessible. In fact, the Prime Minister repeatedly stressed the importance of diversification of energy exports – away from reliance on the United States in view of the continued controversy dogging completion of the Keystone XL Pipeline project – and growth in the Asia Pacific region. Both Prime Minister Harper and Premier Wen referred to the joint feasibility study underway to examine the potential of a free trade agreement. This study will report to both governments in the spring and could lead to the launching of free trade negotiations – which would undoubtedly be a long and challenging process. Any such negotiations would parallel multilateral talks under the Trans-Pacific Partnership which Canada is seeking to join and in which China has not yet indicated a willingness to participate. Canada’s embrace of an Asian orientation will not occur without some detractors. For example, a free trade agreement would likely threaten Canadian agricultural supply management schemes. Nevertheless, Harper’s achievements in China on this trip may well be viewed in the coming years as building the foundation for a new and wider bridge between Canada and China. Of course only time will tell if the promise of this visit materializes into concrete channels for trade and investment flows. This article highlights significant developments in foreign investment review in Canada over the past year. Post Potash Anxiety Lifts in 2012? In the immediate aftermath of the Canadian Government’s rejection of BHP Billiton’s bid for Potash Corporation of Saskatchewan, foreign investors questioned whether there would be a sea-change in Canada’s previous openness to foreign investment. While the failed bid by the LSE for the TMX removed the possibility of another potential rejection, foreign investors, including SOEs, have not been dissuaded from investing in Canada. Despite this, a run at Canadian icons such as Research In Motion could again thrust into the public arena questions of foreign ownership of “national champions” or in “strategic” sectors. As a result, potential acquirors of such targets will need to develop strategies at an early stage to address government and public relations in order to pre-empt, or at least mitigate, any public backlash. The Canadian Government approved a number of state-owned investments in 2011, including Sinopec’s proposed acquisition of Daylight Energy, a Canadian oil and gas company, and CNOOC’s acquisition of oil sands company, OPTI Canada. CNOOC acquired OPTI’s 35 percent working interest in Long Lake and three other project areas located in the Athabasca region of northeastern Alberta. Both investments would have been subject to the Government’s guidelines on state-owned investors which consider the SOE’s corporate governance and commercial orientation in assessing whether the transaction would be of “net benefit” to Canada. In 2010 the Canadian Government sued US Steel for alleged non-compliance with its employment and production undertakings. This represented the first time an investor has been taken to court over a failure to comply with undertakings. In December 2011 US Steel settled the dispute with the Canadian Government, committing to make additional capital investments in its Canadian facilities and to operate certain Canadian plants until 2015. The US Steel case underscores both that the Canadian Government will enforce undertakings in appropriate circumstances (although variations are still possible) and that when formulating 3 or 5 year commitments in relation to an acquisition, foreign investors must carefully consider their ability to meet such undertakings in light of the vagaries of economic conditions. Investors should also proactively manage public and government relations when compliance with undertakings proves difficult. After its rejection of BHP Billiton’s bid for Potash Corporation of Saskatchewan, the Canadian Government indicated its openness to review the Investment Canada Act. In the winter of 2011, the Parliamentary Standing Committee on Industry, Science and Technology invited foreign investment experts to speak about their views on the statute and the review process. However, there has been no public indication since the Government majority win in the May 2011 federal election that the Government intends to resume scrutiny of the foreign investment review process. It is expected that the threshold for review for WTO investors will be $330 million for the year 2012. The official threshold will be published in the Canada Gazette in early 2012. However, what may be of greater interest to foreign investors is whether the Canadian Government finally implements regulations bringing into force amendments made to the Investment Canada Act three years ago. These amendments would raise the review threshold to $600 million in the target’s “enterprise value” for the two years following implementation, to $800 million in the subsequent two years and to $1 billion thereafter (indexed to inflation), thereby reducing the number of investments that are subject to review.